Festive shimmer illuminates the ribbed bodice and accordion-pleated skirt of this sleeveless figure-flattering Parker dress. This dress runs large. We recommend sizing down (see following fit notes for exceptions). 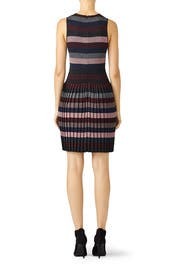 Multi printed knit (57% Rayon, 24% Nylon, 19% Metallic). Full skirt. Sleeveless. Crew neckline. Hidden front zipper with hook-and-eye closure. 36" from shoulder to hemline. Imported. 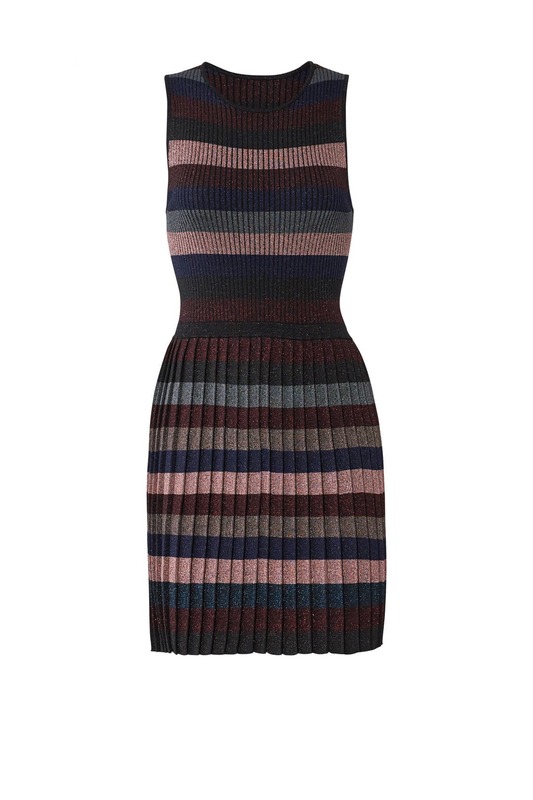 This knit dress was very figure flattering! I like the sparkle woven into the fabric which made it feel a little festive. Great colors for fall/winter. 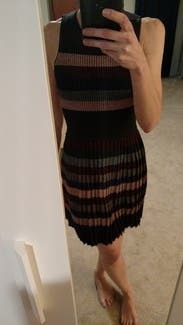 Fun and different dress. Easy to wear to work with tights and a sweater. Hubby complimented it from the first time I tried it on. I liked the sparkle detail, subtle enough that it didn't feel too out of place for the office. This is the best dress I've rented from RTR. Runs slightly large but I still went with my standard size and liked it. Paired with a blazer for work and got many compliments. SO flattering, more sparkly than it looks! This cut is so flattering. 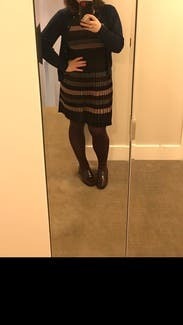 Material is heavier and the coloring includes sparkles which I didn't expect but it was still so cute and looked great with tights and a sweater while at work. I would rent again. I sized down based on other reviews. It fit perfectly on the bottom but for my inverted triangle body shape, it was pulling at the chest area. Too bad because it's gorgeous. Loved everything about this dress. Just a little bit of sparkle to it. This dress is so perfect on. The pleats are pretty and feminine. I wore it for Easter with pink pumps and a black Gucci belt and I didn't want o take it off. I think I may buy it. My only complaint is that the material is itchy. Loved everything else about the dress. Pleats gave it great movement. Topped with a leather jacket in order to make it work appropriate. Perfect for work with a jacket. So many gorgeous colors. Comfortable. Wore this to work with a black cardigan, tights and flats. Super cute and comfortable! Great at 19 weeks preggo! Was a little bit looser than I wanted. The material is a nice knit quality but because of that, I feel like all the weight in the skirt pulled on the top so it didn't give a nice fit or a fitted waist like shown on the model. I planned on wearing this to a party but it didn't have enough pop - the metallics in the material were pretty but overall very subdued - so wore it to work instead with a long sleeve black turtleneck underneath that worked well with it! 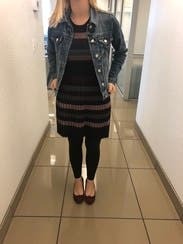 I wore this dress on Thanksgiving Day! I love that it's super cute but is stretchy and hugs in all the right areas! Definitely would rent it again. The material is nice, but did not flatter my pear body. This ain't flattering if you aren't tall because the waist of the dress hits at your hips. Don't recommend. This dress was comfortable and fit me great. The medium was perfect for me, normally I'm a size 8. I wore it several times; to two dinner parties and to work, it worked well for all occasions. Wore with black turtleneck under, black blazer and over knee boots. Great winter work look with color! Comfortable and festive! Nice thick fabric, laid well. Got compliments. 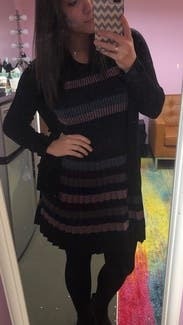 This sweater dress is perfect for when you want to wear something comfortable and cute, but not too hot. The material even has a little bit of shimmer in it to make it extra fun! It's super stretchy, but I think it runs a little big so I'd recommend sizing down for your backup size. This dress is very nice, it's just not me. Plus it was big, and so it didn't quite hang right. Even though it was bigger, it still showed my "lumps" in the back, so I am sure the correct size would have been worse. I also wasn't a huge fan of the metallic sparkles on the dress. For a certain event it would be nice, but ultimately it added something I didn't want there. I did get a lot of compliments though, so I am sure I am just being harsh...but, just wasn't my favourite. I ordered size medium and the dress was too big on the top. I could have taken inches from the straps. If the top was not so big it would have been cute and I would have worn it. This dress is super cute and a little sparkly. But it's still appropriate for work. It requires a lightly weird bra, like a racerback or you have to show a little strap. I've got a pretty round tummy right now. I'm about 20 weeks pregnant, but it looks super good. The pleats are seriously beautiful. I want more dresses like this. Easy, fun, great fabric, stretchy. The dress hung loose on me. If you want it more form fitting, would recommend sizing down. The fabric is thick and stretchy so sizing down won't make the dress look like it's pulling. Not too short at all - completely appropriate for work or school. A lot of shimmer in the fabric. Went with a long black overcoat to dress it down for a more casual look, but could easily be dressed up with some heels. Beautiful quality fabric, pleating stayed neat. I got a ton of compliments on this dress. It fits perfectly and the material is very comfortable. Like a sweater. The cut at the shoulders is almost like a halter because it shows a lot of shoulder which is really pretty. I wore it with black tights and tall black boots. It's a show stopper. 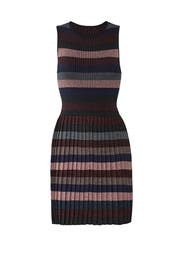 perfect everyday dress for the office! 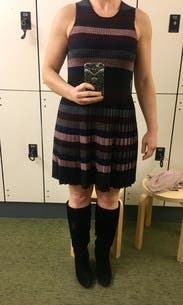 This dress fits true to size and it is a great dress! It has a classy look, but the colors and the fabric add a fun spin to it. The fabric is heavy, but not too warm. It retained its shape and didn't wrinkled after an international flight and back. The zipper was easy to reach and was easy to get in and out without help. I will definitely rent it again. 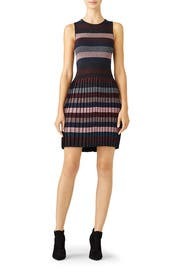 This dress is super fun, a jazzy work dress if you will. 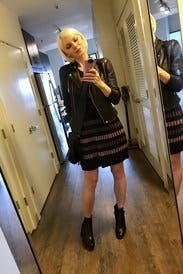 The fabric is a touch itchy and the waist hits at an odd spot, but I wore it with a gray suede moto jacket and mesh booties and it really brought it to life. I thought this would look so cute with a leather jacket for vacation but it just made me look dumpy. Love the shimmer in this and the colors, if you have a long torso this could work for you. Sending back! 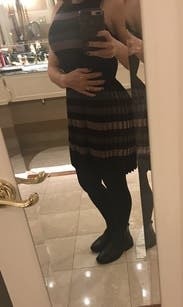 This was the perfect dress for a Holiday party especially at 19 weeks pregnant. Love that it's stretchy, perfect for my growing bump. The fit was very flattering for the bump and the length perfect, not too short but short enough to be cute. The only thing I didn't like was that the arm holes were cut in really far so I really didn't like exposing that under arm skin. Very cute, but not for hourglasses.